I started this blog three years ago as a motivational tool as I trained for my first marathon. 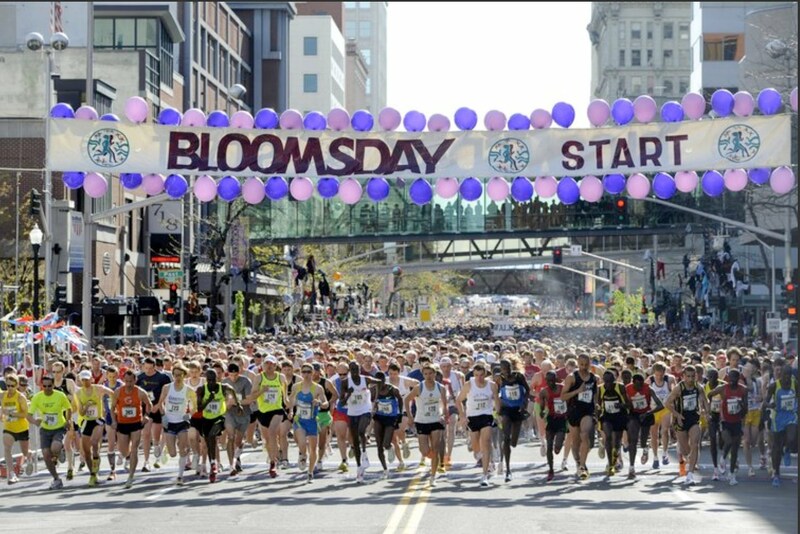 The first event I ever ran in was this little race called the Lilac Bloomsday Run. Little did I know that the race wasn't so little. 50,000 people toe the starting line year after year for this 12k run, making it one of the biggest road races in the country. 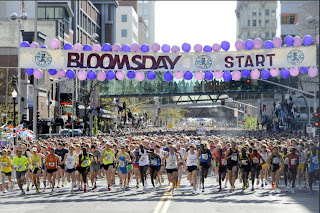 After running Bloomsday three years ago and experiencing the energy and excitement, I was hooked on running. 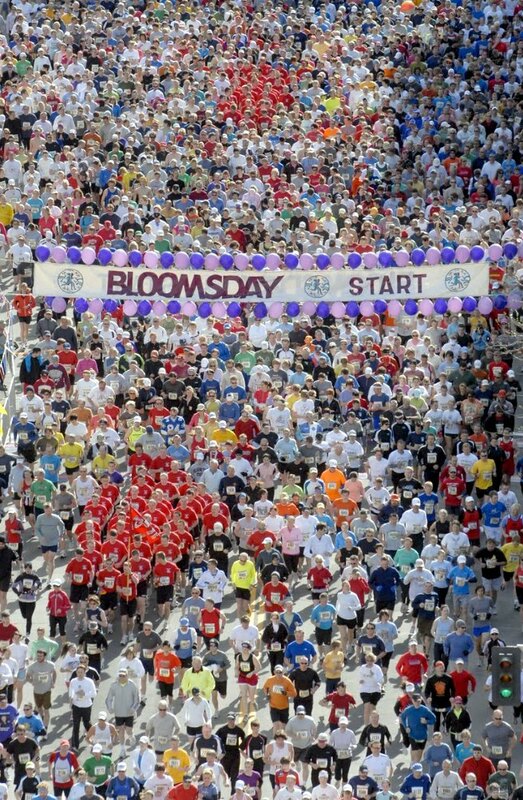 Yesterday was my second time running Bloomsday, and I think it was more fun. I'm in better shape than I was then. I get more excited about running now than I did three years ago (I hope that never fades). And I even had the chance to say hi to Olympian Dan Browne outside the Expo. I had a dream earlier in the week that I won Bloomsday. I thought it was a sign of a legendary athletic performance in the making: "Unknown stuns field of world's top runners to win Bloomsday!" But it wasn't meant to be. I didn't win, and I wasn't even the top American finisher - that went to Dan Browne for the second year in a row. Men's elite field. Winner Peter Kirui is in blue at far right. Chepkurui is leading (in purple) on her way to the world record. Benoit-Samuelson is in rear of lead pack in purple tank and white hat. I had a good race too. A slow first couple of miles, but with such a big crowd there's no use getting frustrated by that. And isn't running more than just seconds on a clock anyway? After a couple of miles the course widens a bit and there's (a little) more room to pick up the pace. Enjoy the pace while you can, because the infamous Doomsday Hill slows everyone down a couple miles later. White hat, yellow singlet, just above lower red-shirted ROTC unit. I crossed the finish line in 48m41s - which placed me 344 out of 49,674 finishers. This has been my sixth race of the year and my fifth PR. Three years into my running life and my legs feel as young and strong as they ever have. I'm so thankful to be healthy. I'm so glad I found running. Great job with another personal record and another year running! I hope that I am as excited and as motivated as you are once I reach my three-year mark. I am so happy you are happy. You are an inspiration to so many, including your slow, but unsteady father. I love reading about your running adventures. I love even more running together when we get the chance. Your time and place in such a large and classic race is more than impressive. Maybe someday that dream of yours will come true. Just keep running! run to stay young my friend. It's pretty awesome, isn't it? Great running Scott, hope you're still enjoying running as much as me when you get to my age!!! Looks like quite the event. Congrats on yet another PR. The Green Silence look cool. I saw a guy wearing them this weekend at the OC Half. That is awesome, Scott! Great job at the race and glad to hear that your legs are feeling so good. Keep up the great work! That's so awesome. Great pictures! What a year you are having. My 40th year, I had a goal to pr in all of the race distances - 2 mile through the marathon. I did it, and it was such a GREAT year. What's left after Boston...I was worried about that too, but I am thankful that I still have some drive left in me, and look forward to getting back to the roads with my running shoes on instead of my walking shoes. That is so amazing to have a great race when the crowd is so big. Keep Running and you will go to Boston too. 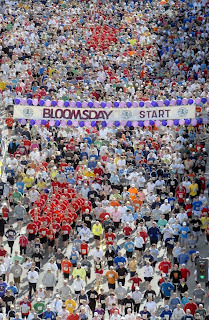 Hey, nice coverage of bloomsday! I placed way behind you, but enjoyed it all the same.